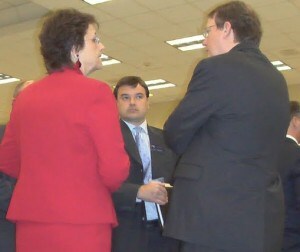 Anti-Community Broadband N.C. State Rep. Marilyn Avila’s Fun Weekend in Asheville: Did You Pay? Rep. Marilyn Avila (R-Time Warner Cable), the North Carolina representative fronting for the state’s largest cable company, sure can sing for her supper. The representative who shilled for North Carolina’s notorious anti-community broadband legislation was the very special invited guest speaker for the cable industry lobbying association annual meeting, held last August in Asheville, according to newly-available lobbying disclosure forms obtained by Stop the Cap! 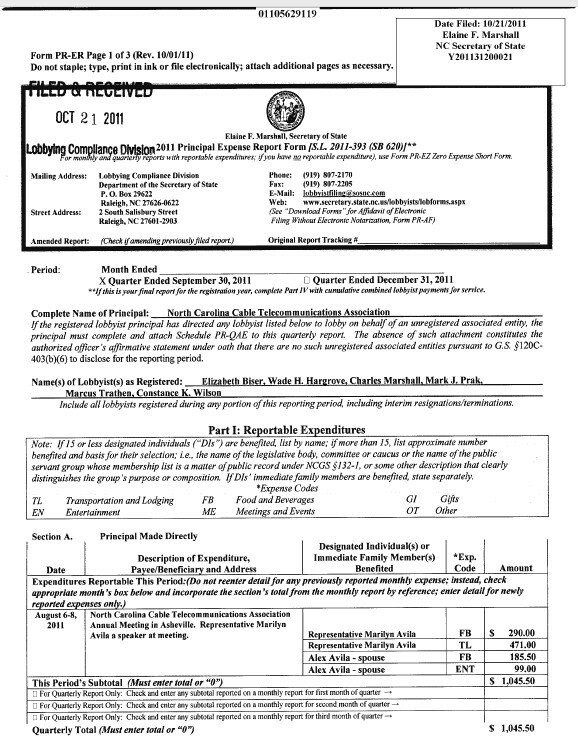 The North Carolina Cable Telecommunications Association reported they not only picked up Marilyn’s food and bar bill ($290 for the Aug. 6-8 event), they also covered her husband Alex, too. Alex either ate and drank less than Marilyn, or chose cheaper items from the menu, because his food tab came to just $185.50. The cable lobby also picked up the Avila’s $471 hotel bill, and handed Alex another $99 in walking-around money to go and entertain himself during the weekend event. The total bill for the weekend, effectively covered by the state’s cable subscribers: $1,045.50. That’s a small price to pay to reward a close friend who delivered on most of the cable industry’s wish-list for 2011. Besides, the recent cable rate increases visited on North Carolina cable subscribers will more than cover the expense. Meanwhile, in a separate disclosure, Stop the Cap! has learned Time Warner Cable covered food and beverage costs for members of the North Carolina General Assembly and their staff who attended the Mardi Gras World celebration in New Orleans, sponsored by corporate front group the American Legislative Exchange Council. ALEC lobbies state legislatures for new laws they claim are grassroots-backed, but are in reality the legislative wish-lists of giant corporate interests, including North Carolina’s largest cable company — Time Warner. The food and bar tab totaled just over $130 for the festivities. Time Warner Cable achieved victory in 2011 passing anti-community broadband legislation through the North Carolina General Assembly, in part thanks to new support from the Republican takeover of the state legislature last year. There should be laws against these types of shenanigans.